Send this delicious gourmet wine basket featuring a duet of Beringer Vineyards Founders Estates Cabernet Sauvignon and Chardonnay! Offers a wide selection of gourmet chocolates, cookies, cheeses, crackers, nuts, candy, and so much more. 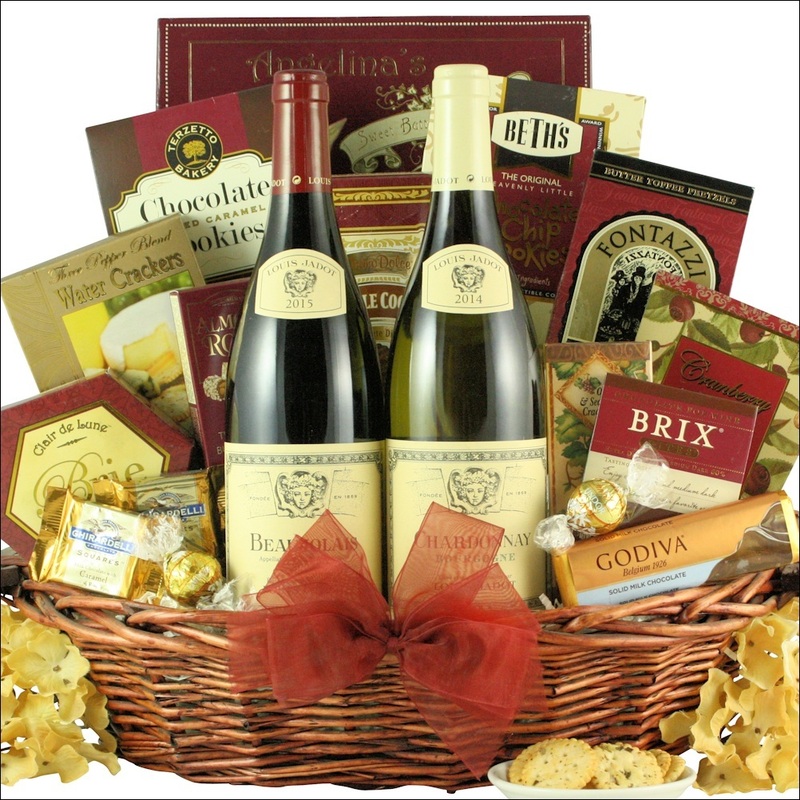 A perfect gourmet wine gift basket to send for any occasion. ... in an Oval Willow Gift Basket with Side Handles. Ships exclusively to USA. See shipping tab for wine shipments restrictions. Louis Jadot Macon Villages Chardonnay White Wine - The Macon Villages area is located in the southern part of Burgundy, close to the Beaujolais area. This appellation is the largest of the Maconnais area, covering about 2500 ha of vineyards and 43 communes. Forty three villages have the right to produce Macon Blanc Villages. Macon Villages are only white wines. The wines are made from 100% Chardonnay grapes. The limestone subsoil of the Monts du Maconnais are ideal for growing the Chardonnay grapes. Some small areas produce exceptional wines. The Louis Jadot Macon Blanc Villages is made from grapes from these different areas. This Chardonnay is airy and easy to drink, lively and charming, this is a fruity wine with a floral scent and a hint of lemon, the Macon Villages should be drunk chilled and rather young. This wine goes very well with a large range of foods including "hors d'oeuvres", fried or grilled fish, sea food, goat's milk cheese, poultry. Louis Jadot Beaujolais-Villages Red Wine Strong red purple colour. Fresh red fruits on the nose with a hint of dark cherry. Slightly spicy with a touch of grey pepper, liquorice and a touch of rose flower. The whole wine is very well balanced with a nice acidity and the tannins presence on the finish invites food pairing such as with Terrines, Charcuteries, Grilled red meat, white fish, cheese or simply as the sole wine of a meal. We cannot ship this wine gift hamper to these states: Alabama, Alaska, Delaware, Kentucky, Mississippi, Montana, New Hampshire, New Mexico, Oklahoma, South Dakota, Texas and Utah. Adult signatures are required on all wine shipments. Wine Basket shipment requires an adult signature. The recipient must provide valid state ID stating they are at least 21 years of age. No wine basket delivery will be left without signature. SendLuv cannot be held responsible for non-delivery if no-one over 21 is able to accept the gift basket. Our gift baskets can be ordered from anywhere in the world to be shipped to your loved ones, family, friends, colleagues, or corporate clients. 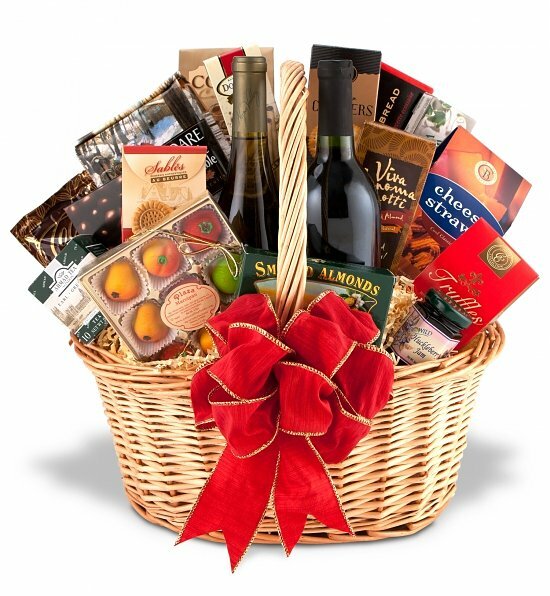 Order our gift hampers from England, Ireland, Scotland, France, Germany, Middle East, Asia, Hong Kong or Australia and do not worry about getting your gift to your gift recipient. We will look after that for you. © 2016 - SendLuv Gift Baskets - All Rights Reserved.